In a completely ironic twist of fate (because I wasn’t sure where I was going to be for Mexican Independence Day, which technically is celebrated today, September 16th), I also wasn’t sure of what I was going to do. Normally, I would join some of the celebrations in Vancouver. 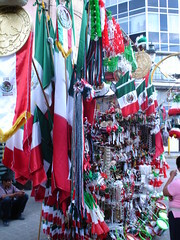 However, since this year there was A LOT of promotion of Mexico in Vancouver (Mexico Fest and Mexi-GO for starters), I didn’t feel bad about writing a general post on where Mexicans could celebrate Independence Day in Vancouver. After all, there were plenty of events to celebrate. I spent it quietly with my Mom, having dinner and a couple of tequilas. I’m incredibly proud to be Mexican, and at the same time, I’m incredibly proud of being Canadian. I owe both countries a lot, and both are amazing in their own ways. But strangely enough, Mexico keeps being looked at by some foreigners (luckily not a lot) as a country of mariachis who travel on burros and only live in shanty towns. Just travel to some of the Mexican cities and you’ll see the difference. My goal in writing about Mexico has always been not to reminisce or long for where I wasn’t (when I lived in Canada) but to showcase that there is another Mexico. The one the mainstream media doesn’t tell you about it. A Mexico I’ve been recently living, with people who work hard, party hard and who have an incredible sense of love, friendship and family. A country with great history and culture. A country I’m proud to call my own. Feliz Dia de la Independencia, Mexico! Happy belated Independence Day, Mexico!